Contributed by Reza Yaghmai1, M.D., Ph.D., Nancy C. Karpinski2, M.D., Wade H. Wong3, M.D., William R. Taylor1, M.D. A 41-year-old white female without significant past medical history presented with a six-month history of progressively worsening headache and a more recent onset of progressive visual complaints. Neurological examination revealed bilateral papilledema and a left homonymous hemianopsia. 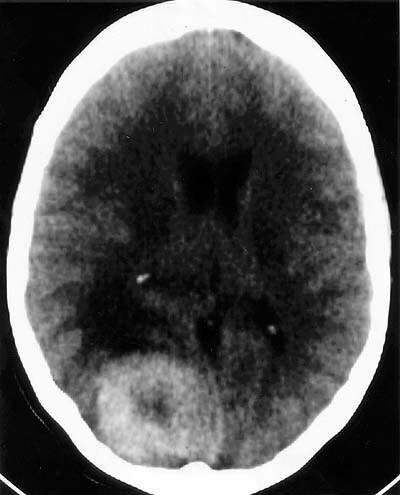 CT scan and MRI showed a well-circumscribed, diffusely enhancing, 4.5 cm, dura based lesion with surrounding edema and mass effect compressing the right occipital lobe as shown in these horizontal and coronal cuts. 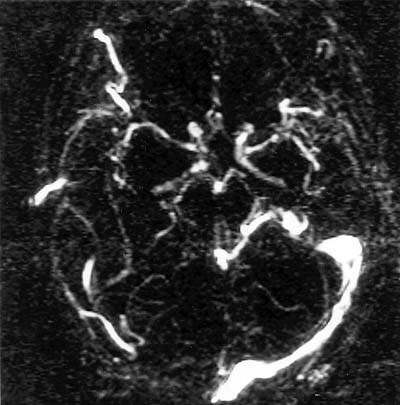 MR venogram demonstrated occlusion of the right transverse sinus. 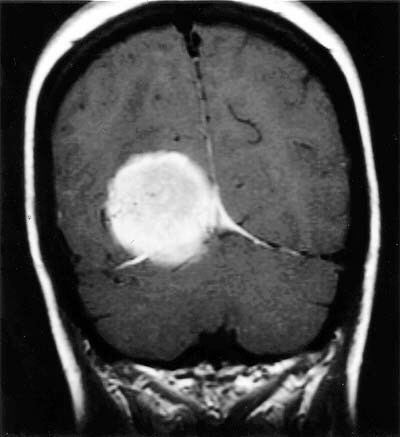 Craniotomy revealed a rubbery, vascular, dura based tumor in the region of the torcula, growing into the transverse sinus.